I find it useful to think of the Enneagram personality styles as nine different paradigms or sets of lenses for looking at the world. A paradigm is a way of organizing and giving meaning to the phenomena within and around us. Helen Palmer (1988) has written about what each Enneagram type pays attention to, nine attentional styles. Piaget (1963) wrote about schemas, templates we develop to organize our experience. So categorizing people has survival value. It helps us predict and control our environment. Cognitive therapists talk about adaptive and maladaptive schemas. If our schemas or paradigms are aligned with reality, if they accommodate themselves to fit what is, they are useful. If they distort reality, if they assimilate reality to fit their preconceptions, they’re not so helpful. Beck noted that schemas bias our interpretation of reality in a consistent manner. When the distortions become pathological, they show up as “typical misconceptions, distorted attitudes, invalid premises, and unrealistic goals and expectations” (1967, p. 284). extremely stable and enduring themes that develop during childhood, are elaborated throughout an individual’s lifetime, and are dysfunctional to a significant degree. These schemas serve as templates for the processing of later experience ( p. 9). 1. Most early maladaptive schemas are unconditional beliefs and feelings about oneself in relation to the environment. Schemas are a priori truths that are implicit and taken for granted….When the schema is activated, individuals believe that they can, at best, delay or hide the inevitable bad outcome such as rejection or punishment. 2. Early maladaptive schemas are self-perpetuating, and therefore much more resistant to change. Because schemas are developed early in life, they often form the core of an individual’s self-concept and conception of the environment. 3. Early maladaptive schemas, by definition, must be dysfunctional in some significant and recurring manner. 4. Early maladaptive schemas are usually activated by events in the environment relevant to the particular schema. That sounds a lot like what is said about the down side of the Enneagram styles. I think of the divine ideas which reside in the high side of the intellectual center as adaptive cognitive schemas or objective paradigms which align us with our true selves and with the real world. Since they more or less accurately map the territory, they’re useful. When we’re on the glide path mentally, our emotions and dispositions come along for the ride. So the virtues in the high side of the emotional center accompany the divine ideas. I think of them as adaptive emotional schemas. On the low side, the intellectual center is influenced by maladaptive cognitive schemas or subjective paradigms which distort the reality of who we are and what we’re surrounded by. A vicious circle gets set up between these distorting beliefs and the passions or maladaptive emotional schemas, that impel rather than inform the emotional center. In his book Reinventing Your Life (1993) which he co-wrote with Janet Klosko, JeffreyYoung popularizes his ideas and calls these early maladaptive schemas “lifetraps.” While he lists 18 early maladaptive schemas in his later work Cognitive Therapy for Personality Disorders: a Schema-Focused Approach (1999), here he describes eleven such lifetraps and includes an unresearched questionnaire consisting of 10 items for each lifetrap to assess their presence. Here are Young’s (1993) brief descriptions of these 11 lifetraps. As far as I know, he derived his lifetraps and early maladaptive schemas apart from any knowledge of the Enneagram types. As you read them, there are some remarkable similarities to the “automatic thinking” associated with the downside of certain Enneagram styles. Two lifetraps relate to a lack of safety or security in your childhood family. These are Abandonment and Mistrust. The Abandonment lifetrap is the feeling that the people you love will leave you, and you will end up emotionally isolated forever. Whether you feel people close to you will die, leave home forever, or abandon you because they prefer someone else, somehow you feel that you will be left alone. Because of this belief, you may cling to people close to you too much. Ironically, you end up pushing them away. You may get very upset or angry about even normal separations. The Mistrust and Abuse lifetrap is the expectation that people will hurt or abuse you in some way-that they will cheat, lie to, manipulate, humiliate, physically harm, or otherwise take advantage of you. If you have this lifetrap, you hide behind a wall of mistrust to protect yourself. You never let people get too close. You are suspicious of other people’s intentions, and tend to assume the worst. You expect that the people you love will betray you. Either you avoid relationships altogether, form superficial relationships in which you do not really open up to others, or you form relationships with people who treat you badly and then feel angry and vengeful toward them. Two lifetraps relate to your ability to function independently in the world. These lifetraps are Dependence and Vulnerability. If you are caught in the Dependence lifetrap, you feel unable to handle everyday life in a competent manner without considerable help from others. You depend on others to act as a crutch and need constant support. As a child you were made to feel incompetent when you tried to assert your independence. As an adult, you seek out strong figures upon whom to become dependent and allow them to rule your life. At work, you shrink from acting on your own. Needless to say, this holds you back. With Vulnerability, you live in fear that disaster is about to strike whether natural, criminal, medical, or financial. You do not feel safe in the world. If you have this lifetrap, as a child you were made to feel that the world is a dangerous place. You were probably overprotected by your parents, who worried too much about your safety. Your fears are excessive and unrealistic, yet you let them control your life, and pour your energy into making sure that you are safe. Your fears may revolve around illness: having an anxiety attack, getting AIDS, or going crazy. They may be focused around financial vulnerability: going broke and ending up on the streets. Your vulnerability may revolve around other phobic situations, such as a fear of flying, being mugged, or earthquakes. Two lifetraps relate to the strength of your emotional connections to others: Emotional Deprivation and Social Exclusion. Emotional Deprivation is the belief that your need for love will never be met adequately by other people. You feel that no one truly cares for you or understands how you feel. You find yourself attracted to cold and ungiving people, or you are cold and ungiving yourself, leading you to form relationships that inevitably prove unsatisfying. You feel cheated, and you alternate between being angry about it and feeling hurt and alone. Ironically, your anger just drives people further away, ensuring your continued deprivation. Social Exclusion involves your connection to friends and groups. It has to do with feeling isolated from the rest of the world, with feeling different. If you have this lifetrap, as a child you felt excluded by peers. You did not belong to a group of friends. Perhaps you had some unusual characteristic that made you feel different in some way. As an adult you maintain your lifetrap mainly through avoidance. You avoid socializing in groups and making friends. You may have felt excluded because there was something about you that other children rejected. Hence you felt socially undesirable. As an adult you may feel that you are ugly, sexually undesirable, low in status, poor in conversational skills, boring, or otherwise deficient. You reenact your childhood rejection-you feel and act inferior in social situations. It is not always apparent that someone has a Social Exclusion lifetrap. Many people with this lifetrap are quite comfortable in intimate settings and are quite socially skilled. Their lifetrap may not show in one-to-one relationships. It sometimes surprises us to realize how anxious and aloof they may feel at parties, in classes, at meetings, or at work. They have a restless quality, a quality of looking for a place to belong. The two lifetraps that relate to your self-esteem are: Defectiveness and Failure. With Defectiveness, you feel inwardly flawed and defective. You believe that you would be fundamentally unlovable to anyone who got close enough to really know you. Your defectiveness would be exposed. As a child, you did not feel respected for who you were in your family. Instead, you were criticized for your “flaws.” You blamed yourself–you felt unworthy of love. As an adult, you are afraid of love. You find it difficult to believe that people close to you value you, so you expect rejection. Failure is the belief that you are inadequate in areas of achievement, such as school, work, and sports. You believe you have failed relative to your peers. As a child, you were made to feel inferior in terms of achievement. You may have had a learning disability, or you may never have learned enough discipline to master important skills, such as reading. Other children were always better than you. You were called “stupid,” “untalented,” or “lazy.” As an adult, you maintain your lifetrap by exaggerating the degree of your failure and by acting in ways that ensure your continued failure. Two lifetraps deal with Self-Expression–your ability to express what you want and get your true needs met: Subugation and Unrelenting Standards. With Subjugation, you sacrifice your own needs and desires for the sake of pleasing others or meeting their needs. You allow others to control you. You do this either out of guilt–that you hurt other people by putting yourself first–or fear that you will be punished or abandoned if you disobey. As a child, someone close to you, probably a parent, subjugated you. As an adult, you repeatedly enter relationships with dominant, controlling people and subjugate yourself to them or you enter relationships with needy people who are too damaged to give back to you in return. If you are in the Unrelenting Standards lifetrap, you strive relentlessly to meet extremely high expectations of yourself You place excessive emphasis on status, money, achievement, beauty, order, or recognition at the expense of happiness, pleasure, health, a sense of accomplishment, and satisfying relationships. You probably apply your rigid standards to other people as well and are very judgmental. When you were a child, you were expected to be the best, and you were taught that anything else was failure. You learned that nothing you did was quite good enough. The final lifetrap, Entitlement, is associated with the ability to accept realistic limits in life. People who have this lifetrap feel special. They insist that they be able to do, say, or have whatever they want immediately. They disregard what others consider reasonable, what is actually feasible, the time or patience usually required, and the cost to others. They have difficulty with self-discipline. Many of the people with this lifetrap were spoiled as children. They were not required to show self-control or to accept the restrictions placed on other children. As adults, they still get very angry when they do not get what they want. wanted to see whether there were any correlations between the Enneagram styles and these 11 lifetraps so I gave participants in my Enneagram Spectrum Training and Certification Programs the Wagner Enneagram Personality Style Scales, published by Western Psychological Services (1999) and the items from the Lifetraps Questionnaire, found in Young’s book Reinventing Your Life (1993). The WEPSS measures the high, resourceful, adaptive side of each Enneagram style along with the low, non-resourceful, maladaptive dimension of each style and gives an overall score for each type. So far 125 people have participated in this study. There are 44 men (35%) and 81 women (65%). Their ages range from 27 – 72 with an average age of 48. Most of the participants are from across the United States, but there are also people from Asia, Europe, Africa, and Australia. So it’s an international sample. All of the participants have four or more years of higher education. I used SPSS software to find the means, standard deviations and Pearson correlations for the data, using a two- tailed test to measure the significance of the correlations since it is more stringent than a one-tailed test. Figure 1 gives the range, mean, and standard deviation for each scale on the WEPSS and Lifetrap Questionnaire. Figure 2 gives the intercorrelations among the WEPSS and lifetrap scales. 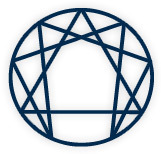 The results are quite consistent with the descriptions of the Enneagram styles and the 11 lifetraps or maladaptive schemas, thus providing some concurrent validity for both measures. You will notice that the negative or non-resourceful scale for each Enneagram style correlates consistently more highly with the 11 lifetraps than does the positive or resourceful scale of each Enneagram type. That’s what you would expect if the high side of the style utilizes adaptive schemas while the low side of the style uses maladaptive schemas. The significant correlations are found on the left side of each box in Figure 2. A single asterisk means that 5 times out of 100 you would expect this large a correlation to occur by chance while a double asterisk means that 1 time out of 100 you would expect this large a correlation to occur by chance. We see that Twos, Fours, and downside Sixes identify with the abandonment lifetrap. People will leave you unless you are helpful, special, and loyal enough. Paradoxically, your suspicions, clinging, and closeness may bring about the very thing you fear most: being rejected. Downside Ones, Twos, and Fours identify with the mistrust and abuse lifetrap. People will hurt, abuse, or humiliate you in some way and you need to be aware of their intentions. The Ones’ resentment, the Twos’ fury at being scorned, and the Fours’ envy might be at play here. I was surprised that Sixes didn’t identify more with this schema. Ones, Twos, Fours, Fives, and Sixes identify with the emotional deprivation lifetrap while there is a low, but statistically significant, negative correlation with the Nines. This is the maladaptive belief that your emotional needs won’t be met. Your emotional response might be to feel angry (#1), hurt (#2), misunderstood (#4), cold (#5), cheated (#6). Since Nines are said to feel uncared for and unimportant, I’m surprised they dis-identified to some extent with this schema. Maybe they’re still numbing out to it. Fours, Fives, and Sixes identify with the social exclusion maladaptive schema while Threes and Sevens do not identify with this lifetrap. While 4’s, 5’s, and 6’s feel outside the game and/or different, 3’s and 7’s put themselves in the action with the in crowd. Twos, Fours, Fives, Sixes, and Nines identify with the dependence lifetrap. Threes and Eights correlate negatively with this schema. With the dependence schema, you need others to reinforce your self esteem and you feel anxious when you stand alone. 5’s seem out of place here since they strive to be self-sufficient. Perhaps their privacy and “loner” persona are counter-dependent maneuvers against feeling too needy. While 3’s come alive at the sound of applause, they are certainly competent and capable of initiative and so don’t identify with this maladaptive schema. 8’s, as you will see, deny any maladaptive schemas. Apparently their defense is working well. Twos, Fours, and Sixes identify with the vulnerability lifetrap. This is the maladaptive belief that the world is not safe and you may not be hardy enough to ward off being hurt. Ones, Fours, and Sixes identify with the defectiveness lifetrap while Sevens and Nines do not. This is the belief that you are flawed and if people really knew you, they would reject you. So while 1’s, 4’s, and 6’s have to do something about themselves, 7’s and 9’s are OK as they are. Sixes identify with the failure lifetrap. Threes and Eights do not identify with this maladaptive schema. So 6’s seem to believe that you’re OK but they’re not. While 3’s and 8’s believe that they’re OK and you may or may not be OK. If you’re not OK, they’ll either help you be more effective (#3) or it’s your problem (#8). Twos, Sixes, and Nines identify with the subjugation lifetrap while Eights do not. Subjugation means you put others’ needs ahead of your own to please them (#2), for fear you will be punished (#6), lest you upset the harmony of the universe (#9). 8’s would be those to whom 2’s, 6’s, and 9’s subjugate themselves. Ones, Twos, Threes, Fours, Sixes, and Eights identify with the unrealistic standards schema while Nines do not. 1’s, as would be expected, identify the most with this lifetrap. While all the types strive to live up to the standards of their characteristic self image and so are tyrannized by their particular shoulds, 9’s should be relaxed about all this so they don’t identify with this schema – even though they “should” be laid back. Finally Twos, Threes, Fours, and Sevens identify with the entitlement lifetrap while Fives and Nines do not. I was surprised at this outcome. Perhaps 2’s feel entitled for all that they’ve done for others, 3’s for all that they’ve achieved, 4’s for all that they are, and 7’s just don’t like restrictions placed on them. I thought 8’s would identify with this schema. Perhaps they really don’t feel entitled, don’t believe others will give them what they need, and so they have to take it. I will be gathering more data (as is my custom) since a larger N is needed to do more sophisticated statistical analyses. Someone suggested that subtype variations might play a role in the results so this will require even more participants. Look for a follow-up to this article as more results come in. Beck, Aaron. Depression: Causes and Treatment. Philadelphia: University of Pennsylvania Press, 1967. Flavell, John. The Developmental Psychology of Jean Piaget. New York: Van Nostrand, 1963. Palmer, Helen. The Enneagram. San Francisco: Harper and Row, 1988. Wagner, Jerome. Wagner Enneagram Personality Style Scales: Manual. Los Angeles: Western Psychological Services, 1999. Young, Jeffrey & Janet Klosko. Reinventing Your Life. New York: Dutton, 1993. Young, Jeffrey. Cognitive Therapy for Personality Disorders: a Schema-Focused Approach, 3rd ed. Sarasota: Professional Resource Press, 1999.